One touch collaboration for remote teams. Bring Skype to your meeting. Enable interactive Skype for Business and Microsoft Teams meetings in rooms of all sizes. Leverage the power of Skype for Business and Microsoft Teams in your meeting rooms and collaboration spaces. With flexible screen sizes, multiple camera options and the ability to integrate with existing audiovisual equipment, a Skype Room System offers a premium boardroom grade video conferencing experience combined with the simplicity of Skype. Bring remote teams together and actively engage participants with interactive content sharing from any Skype-enabled device. Leverage the power of Skype for Business and Microsoft Teams in your meeting rooms and collaboration spaces. With flexible screen sizes, multiple camera options and the ability to integrate with existing audiovisual equipment, a Skype Room System offers a premium boardroom grade video conferencing experience combined with the simplicity of Skype. Bring remote teams together and actively engage participants with interactive content sharing from any Skype-enabled device. With Microsoft certified room systems. Native integration with Microsoft Exchange and Office. Because it’s Skype, scheduling your meeting or video conference has never been easier. Native Exchange integration means that you can just book your meeting inside your Outlook calendar and then make it a Skype meeting with one simple click. Participants can join on any device, even via a web browser if they don’t have a Skype for Business account or app installed. Begin meetings in seconds. Simply touch your meeting tile on the desktop panel or an interactive display and you are up and running. Exchange syncing and presence detection features mean that when you walk into your meeting room, the system is on and your meeting is ready to go. 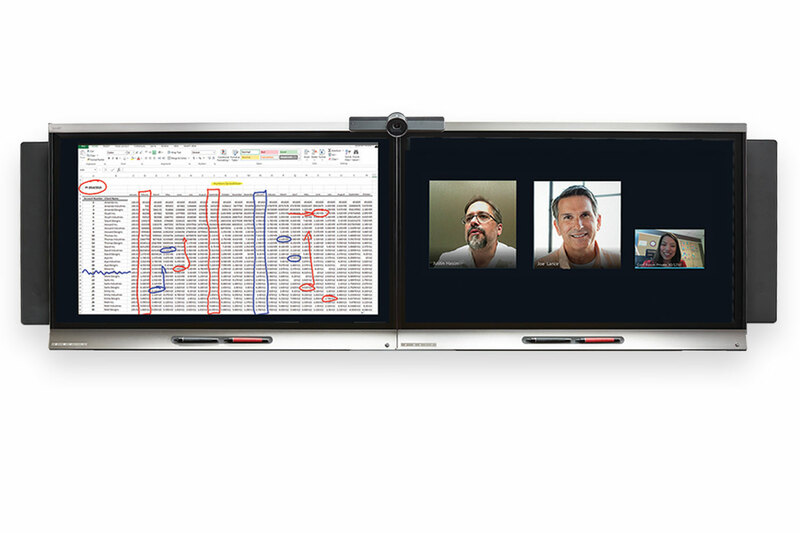 Just touch your meeting tile on the screen or table-top control panel and you are up and running. Ad-hoc meetings are a breeze too, just click ‘meet now’ and type in the email addresses of the people you want to meet with. Because people know how to use it already, barriers to adoption are removed from the equation. Skype Room Systems are Microsoft certified appliances, which translates to a seamless user experience in the meeting room environment. Operation controls and screen layouts are built from the desktop client interface, ensuring minimal training is required. Everything from dialling an audio endpoint to sharing an Excel spreadsheet during a video conference is as simple as a normal Skype call. A kit for every size room. Multiple vendors and flexible configuration ensures you get the right fit for every meeting space. Screen sizes up to 200 inch. Please contact our friendly staff at one of the phone numbers below, or submit a contact form and we will get back to you within 24 hours. We're not around right now. But you can send us an email and we'll get back to you, asap. Please make sure to include which state you are contacting us from so that we can direct your query. I consent to Pro AV Solutions collecting my details through this form.